The Easter Bunny And Its Eggs: Where Did They Originate From? When Easter comes around, no animal becomes more popular than the bunny. We see it in chocolate form, as stuffed animals, on greeting cards, and various Easter themed items. The bunny has no doubt become a symbol for the Christian holiday, and has also become the “Santa Claus” of Easter, as the pointy-eared friend is said to bring chocolate and toys to children. But where did the bunny originate from? Let’s take a quick look. Hares and bunnies are said to have appeared in motif art in medieval times, with it being believed that the hare was a hermaphrodite since it was thought to have been capable of reproducing without loss of virginity. This thus led the hare to be associated with the Virgin Mary and appearing in manuscripts and forms of art. It is also stated that the hare was associated with the Teutonic deity Eostra, who was the goddess of spring and fertility. She was one of the many worshiped gods and goddesses in 13th century Germany and her symbol was the rabbit because of the animal’s high reproduction rate. 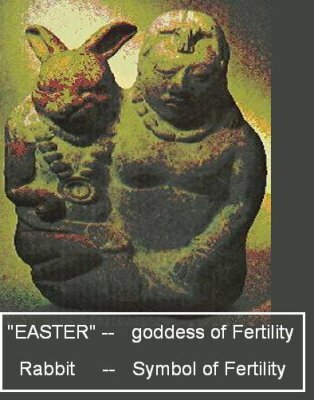 How this all ties into Easter is that spring is known as a time of rebirth and renewal, and the bunny essentially symbolized such ability of giving birth and life. This idea is also why eggs have come into relation with the holiday, as eggs are a sign of birth and fertility. So we now understand how the bunny became linked with the idea behind Easter’s theme of rebirth, but when did it become a staple in the world of children? Apparently in Germany in 1680, there was a legend published about a bunny laying eggs and then hiding them in a garden – German immigrants brought this story along with them when they immigrated to the United States in the 1700’s. What soon followed was the idea of making nests on Easter for this folktale bunny to lay its eggs into – over time, this idea evolved into today’s well-known tradition of creating Easter baskets, and using these on Easter egg hunts. We hope that you found this bit of history interesting. Sometimes we take tradition and folklore at face value and don’t really question the roots of such symbols, so it’s nice to learn a few things about a holiday and how certain things became associated with it. We wish you all a Happy Easter!